﻿ John 3:18 "He who believes in Him is not judged; he who does not believe has been judged already, because he has not believed in the name of the only begotten Son of God. Whoever believes in him is not condemned, but whoever does not believe has already been condemned, because he has not believed in the name of God's unique Son. 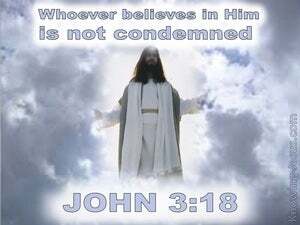 He who believes in him is not condemned. He who does not believe has been condemned already, because he has not believed in the name of the only begotten Son of God. 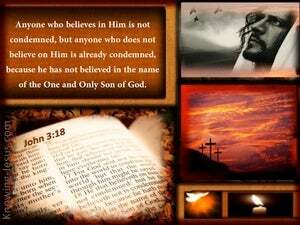 He that believes on him is not condemned; but he that believes not is condemned already, because he has not believed on the name of the only begotten Son of God. He who believes in him is not condemned; but he who does not believe is condemned already, because he has not believed in the name of the only Son of God. he that believeth on him, shall not be condemned: but he that believeth not, is condemned already, because he hath not believed in the only begotten son of God. 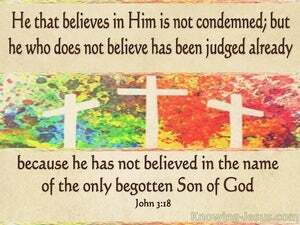 He that believeth on Him is not condemned; but he that believeth not, has already been condemned, because he has not believed on the name of the only begotten Son of God. No one who believes in him has to come up for judgment. 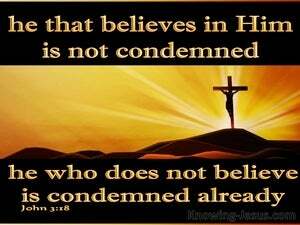 Anyone who does not believe stands condemned already, for not believing in God's only Son. 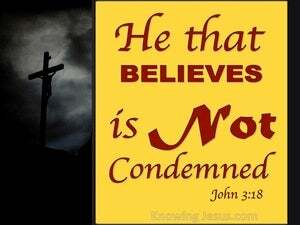 He that believeth on him, is not condemned; but he that believeth not, is condemned already, because he hath not believed on the name of the only begotten Son of God. He that believes on him is not condemned, but he that does not believe is condemned already because he has not believed in the name of the only begotten Son of God. He believing in him is not judged: and he not believing has been already judged, because he has not believed in the name of the only born Son of God. The one who believes in him is not judged, but the one who does not believe has already been judged, because he has not believed in the name of the one and only Son of God. He who believes on Him is not condemned, but he who does not believe is condemned already, because he has not believed in the name of the only-begotten Son of God. He that believeth on him shall not be condemned. 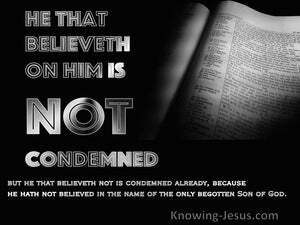 But he that believeth not, is condemned already, because he believeth not in the name of the only son of God. He who believes in him is not sentenced; he who will not believe is sentenced already, for having refused to believe in the name of the only Son of God. He who trusts in him is not condemned, but he who does not trust has already been condemned, because he has not put his trust in the name of the only begotten Son of God. He that believeth in him is not condemned; he that believeth not hath already been condemned, because he hath not believed in the name of the only begotten Son of God. He that believes in him is not judged; but he that believes not has been judged already; because he has not believed in the name of the only Son of God. He that believeth on him, is not to be judged: he that believeth not, already, hath been judged, - because he hath not believed on the name of the Only Begotten Son of God. 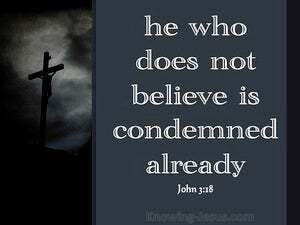 He that believeth on him is not condemned: but he that believeth not is already under condemnation, because he hath not believed on the name of the only begotten Son of God. He who believes in him escapes condemnation, while he who does not believe in him is already condemned, because he has not believed in the only Son of God. 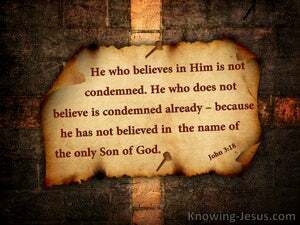 He that believeth on him, is not condemned: but he that believeth not, is condemned already, because he hath not believed in the name of the only-begotten Son of God. Whoever trusts in Him is never to come up for judgment, but whoever does not trust in Him has already received his sentence, because he has not trusted in the name of God's only Son. He who believes in him is not judged. He who doesn't believe has been judged already, because he has not believed in the name of the one and only Son of God. He that believes on Him is not judged; he that believes not has been judged already, because he has not believed on the name of the only begotten Son of God. He that believeth on Him is not condemned: but he that believeth not, is already condemned; because he hath not believed on the name of the only-begotten Son of God. he who is believing in him is not judged, but he who is not believing hath been judged already, because he hath not believed in the name of the only begotten Son of God. 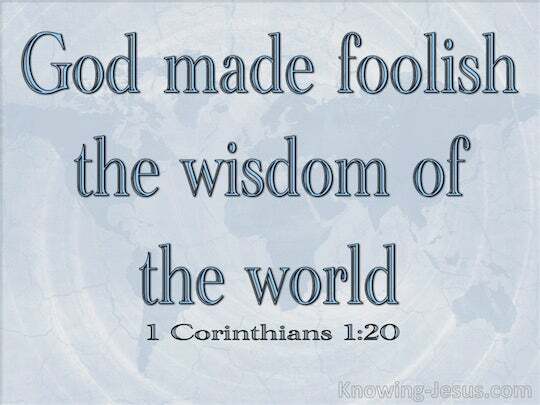 17 "For God did not send the Son into the world to judge the world, but that the world might be saved through Him. 18 "He who believes in Him is not judged; he who does not believe has been judged already, because he has not believed in the name of the only begotten Son of God. 19 "This is the judgment, that the Light has come into the world, and men loved the darkness rather than the Light, for their deeds were evil.